王崇, 王秀华, 刘爽, 桑松文, 张庆利. 鲫鱼自然感染对虾偷死野田村病毒(CMNV)的初步研究[J]. 渔业科学进展, 2019, 40(2): 25-32. DOI: 10.19663/j.issn2095-9869.20180420006. WANG Chong, WANG Xiuhua, LIU Shuang, SANG Songwen, ZHANG Qingli. Preliminary Study on the Natural Infection of Carassius auratus with Covert Mortality Nodavirus (CMNV)[J]. Progress in Fishery Sciences, 2019, 40(2): 25-32. DOI: 10.19663/j.issn2095-9869.20180420006. Corresponding author: ZHANG Qingli, E-mail: zhangql@ysfri.ac.cn. Abstract: Viral covert mortality disease (VCMD) is an emerging disease caused by covert mortality nodavirus (CMNV). VCMD recently resulted in severe economic losses in China due to shrimp aquaculture infections. To identify the natural hosts of CMNV in the pond culture system, samples of Carassius auratus were collected for testing purposes from the drainage channel of a shrimp farm affected by VCMD. 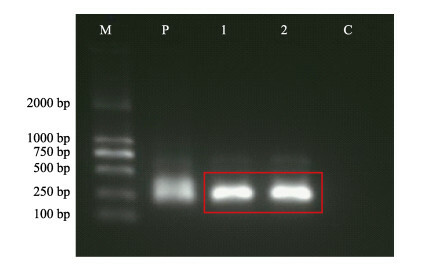 The results of CMNV reverse transcription nested PCR showed that the RNA of C. auratus sample could be amplified and produced the expected target gene fragment. 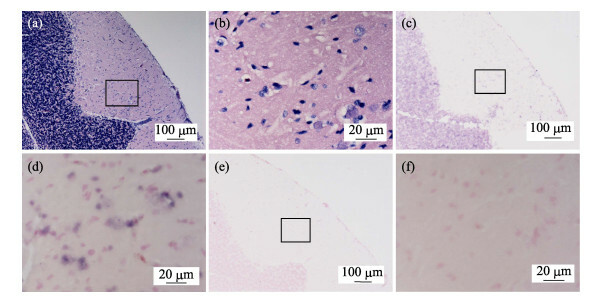 Histopathological analysis showed that CMNV infection in C. auratus caused brain nervous tissue vacuolation. Obvious karyopyknosis occurred in the corpora bigemina granular cells and cortical pyramidal cells. In situ hybridization analysis showed CMNV positive signals in regions of the brain and cardiac muscle with pathological damage. Transmission electron microscopy analysis verified the brain nervous tissue vacuolation and the presence of CMNV particles in the cardiac muscle. The results of the present study indicate that CMNV can cross the species barrier to infect fish and cause pathological damage in the target tissues. Our findings emphasize the need for paying close attention to the high risk of CMNV infections in other fish species, especially freshwater fishes.